A crop of the cover art. Some NBA legends become sports announcers. Other become movie stars. But only one has branched out into writing mystery novels starring Sherlock Holmes’ older brother. Kareem Abdul-Jabbar’s second book in this series, Mycroft and Sherlock, is out October 9, and we’ve got an exclusive sneak peek. Mycroft and Sherlock is the follow-up to 2015's acclaimed Mycroft Holmes (both books are co-written by Abdul-Jabbar and Anna Waterhouse). 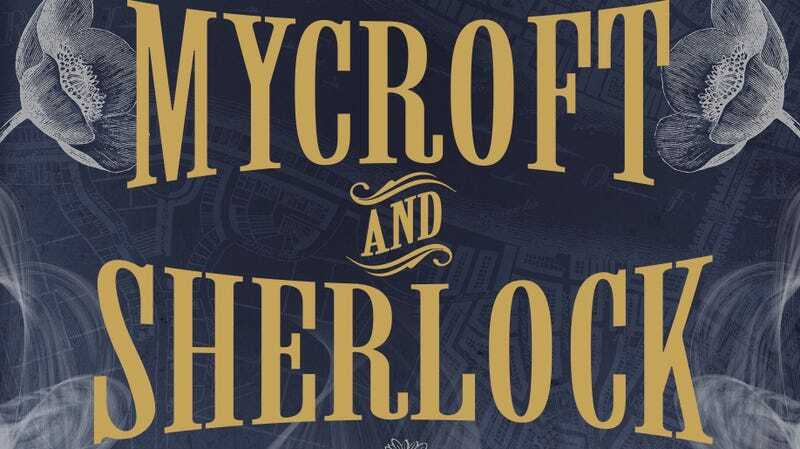 As the title suggests, this new novel features both Holmes brothers—in this take on the characters, Mycroft is 26, and Sherlock’s “nearly 19”—as they get caught up in a series of murders tied into London’s opium trade. The section we’re sharing here gives you a glimpse of how main character Mycroft is portrayed in the book...as well as his amusingly contentious relationship with his eccentric younger brother. Mycroft heard Huan’s knuckles rap against the trap door. He looked up from his papers and tried to shake off the feeling of disorientation and nausea that seemed to plague him as of late. From the window he spied the National Standard Theatre, where he and Sherlock had arranged to meet. The area was both down-at-heel shabby and oddly genteel, crowded with public houses, pleasure gardens, shops and bazaars. “Your brother, he cares for theatre?” Huan called out. As the carriage drew nearer and Huan fought for preeminence among cabs, carts and brewers’ drays, Mycroft could see three figures underneath the theatre’s great colonnade. One he recognized immediately: the profile reminiscent of a bird of prey, the tall, angular, even consumptive frame. If his identity had been in doubt, the instrument case that lay nearby—which Mycroft knew held a vielle, the five-string precursor of the violin, and Sherlock’s latest passion—would have clinched it. The two shorter, well-planted fellows were Sherlock’s best and likely only friends, a strange set of twins named Eli and Asa Quince. They had longish hair the color of wet sand, and features so punctiliously carved that they could have been mistaken for ventriloquists’ dummies. Despite the frigid November morning, there they were— the three eccentrics of Downing College in their shirtsleeves— practicing a combat of their own design that incorporated boxing but which also involved a short staff. They were using the columns as obstacles and barricades. And although the theater would not open for several more hours, why the proprietor was not coming after the boys with the pointy end of a broom was a mystery to Mycroft. Sherlock was beating the stuffing out of them. His limbs might’ve recalled a scarecrow, had he been less subtle in his dealings and less deadly in his aim. At nearly nineteen, he had become a rather ferocious athlete. Mycroft watched his brother, uncommonly pleased to see how well he tucked his chin in and kept his wrists slightly bent to avoid injuring himself in a hit. Even his elbows were remaining closer to his body. Sherlock must’ve distinguished the sound of the carriage from amongst all the others because he whisked round to look— just as one of the twins attempted to brain him with a short staff. But Sherlock was too quick. He ducked out of the way, pivoting to avoid a right hook, then with a side pass managed to land his own staff in the vicinity of the twin’s spleen, while a left hook to the second twin’s jutting chin sent him sprawling atop his brother. “Ah! You see the jabs coming fast,” Huan was declaring all the while. “Long reach, feet move, quick mix, good mind! Well done, Master Sherlock!” he bellowed upon the final blow, punctuating his praise with a round of applause. Sherlock glanced blankly down at his vanquished friends. Then, instead of extending his hand in a sportsmanlike gesture—as Mycroft had dared to hope—he gathered up his vielle case, his short staff and his jacket, which lay on the ground along with the rest. Slipping it on, he removed the briar pipe from the pocket, packed and lit it. At last, pipe between his teeth, and without a word of goodbye, he sprinted towards the waiting carriage. “There they are!” Sherlock said by way of greeting as he slid inside Mycroft’s carriage. In one long move, he deposited instrument and short staff, reached across Mycroft, snatched the newspapers off the seat and propped them on his jutting knees. “No farewells to friends?” Mycroft asked. With that, he lay back, opened up the Daily Telegraph, removed his pipe from between his teeth, and exhaled a long, bilious cloud of smoke. Mycroft coughed. “It is even more acrid than those cheap cigarettes you used to smoke,” he complained, waving a hand in front of his nose. When a concept penetrated, Sherlock would execute a hardly perceptible jerk of the head, as if he’d just thrown a thought into the uppermost drawer of his mind to be extracted when needed. “Is that all?” Mycroft asked acerbically. As Sherlock perused the crime column in the Daily News, he frowned. “Heard it, solved it, insipid, yet another theft in St. Giles, imagine that; some days are barely worth opening one’s eyes for—wait, there is something!” he declared. “‘Shocking discovery,’ Russell Square, throat slit... promising!” He carefully tore the column out, pocketing it. “I take it the Savage Gardens Murders do not interest you?” Mycroft asked. Mycroft sighed. He detested hearing his own unfiltered thoughts coming out of his brother’s mouth. “You are not saying, because they are Oriental, that they have no value, I hope?” he reproved Sherlock. “I am saying it probably has to do with lucre or some battle over territory and the like. In other words, a colossal bore.” Sherlock was about to turn a page when something appeared to occur to him. He glanced out of the window. Then he looked over at Mycroft. “We are not moving,” Sherlock said. “But I have all I need. My music, my short staff, my hat, my shag...” He patted the waistcoat pocket that held his tobacco. The threat hit its mark. There would be no more arguing. Sherlock opened the door of the cab and walked towards the shop, a ribbon of charcoal smoke trailing in his wake. He is getting more difficult, Mycroft grumbled to himself. Perhaps he let Sherlock get away with too much. Perhaps instead of allowing him to lounge about with his nose buried in agony columns and tales of murder, his briar pipe polluting the rooms like a bad spell of winter fog, what he needed was a dose of how the other half lived. Being made to volunteer even a few hours at Cyrus Douglas’s school might be the ticket. I could take him to Douglas, make my appointment with the Queen, then have a bite to eat before retrieving him. Mycroft was particularly fond of that last notion. Even breaking bread with Sherlock had become a chore. Either he ignored the food laid before him and said not a word, or else would criticize everything, from chewing to digestion, in minute detail. He stared out of the window again. The twins had by that time picked themselves up and hobbled off. But just then, hurrying towards the Standard, Mycroft noticed a rather pinched and austere little man in a much-mended overcoat. Excerpt from Mycroft and Sherlock by Kareem Abdul-Jabbar and Anna Waterhouse, reprinted by permission. Copyright Titan Books. Mycroft and Sherlock, by Kareem Abdul-Jabbar and Anna Waterhouse, is out October 2. Hey, Are You Ready for a Bunch More Movies of RDJ&apos;s Sherlock Holmes?